Sorry for the multi-day hiatus here at law:/dev/null. There’s been some personal stuff going on behind the scenes that has really sapped my motivation to be productive,1 and unfortunately that included writing an entry for the blog. Back during 1L Orientation a couple weeks ago, the NCCU Law Student Bar Association put together a student panel where the 1Ls could ask us any questions they wanted. The 2012 class president and I represented the 2Ls, while the SBA President, Vice President and Parliamentarian offered the 3L perspective. One of your colleagues on the panel said she studied 60 hours a week to get her grades. Do we really need to study that much? Don’t focus as much on the exact number of hours she quoted as on what she said afterwards: you have to know yourself. No one can gauge your own strengths and weaknesses, your own study habits, your goals, and so on better than you. That’s going to be a huge determinant in how much you study. For example, I didn’t study anywhere near 60 hours a week during my 1L year. After spending over a decade working in the legal arena, a lot of the terminology and reasoning came naturally to me — so I maybe studied 2 hours a day at most, and most of that was just doing the required readings. Some of your classmates will genuinely need to study that much, based on their study habits or their scholastic objectives or other issues; we certainly had folks like that in my classes last year. But you’re not going to get anywhere comparing yourself to them. Remember: law school is a marathon, not a sprint. If you want to gauge whether or not you’re “messing up already” before midterms, reflect on how well you’re able to understand the material and follow along in class. If you’re totally lost, go see your professor. If you see you’re professor and you’re still totally lost, then think about studying a bit harder or checking the law library for a hornbook or other useful supplement. How time-consuming is being an SBA Representative or some of these other clubs? Do you think I’ll have time to do that and study? All of the SBA Representatives will need to participate in the normal SBA meetings, including when we hear requests for funding from all the student groups which historically takes about 6-7 hours. SBA Reps are also required to have office hours (good study time) and help with planning/implementing any SBA events that get held. If this were the entire equation, I’d say “Of course you’ll have time”… but only you will know what grades you’re aiming for and how much you’ll need to study to get there. I’d encourage you to run regardless — if nothing else, it’s a great opportunity to get out and meet your fellow 1Ls — but whether you’ll have time for it is a judgment call you’ll have to make for yourself. I’m having trouble deciding whether or not to do my case briefing based on the outlines the 2Ls gave me, the stuff I find on random case briefing websites, or just do the reading and brief it all on my own? A combination of the two or three? A: Definitely do the briefing all on your own, at least for the first few weeks. The stuff 2Ls pass down to 1Ls is designed to serve as a template since you’ll have no clue what to look for when you first start out. The whole point to briefing on your own is to train your mind to recognize the important stuff in a case. After you’ve been at it for a month or two, odds are good you’ll be in the habit of briefing the case in your mind as you read — this is the precursor to the common “book briefing” you’ll see other students using, where stuff like “Issue” and “Rule” get scrawled in the margins of the textbook. At that point folks will start using the 2L briefs to save time, because by that point in the semester you’ll be focusing more on outlining than you will on case briefs. Is law school really just a big head game? What’s the biggest difference between 1L year and 2L year? A: To the first question, I’d say yes. You’ll hear folks repeat the law school aphorism “Your first year they scare you to death, your second year they work you to death, and your third year they bore you to death.” But if you know you want to be a lawyer and you’re determined to do whatever it takes to achieve that goal — or, conversely, you have a backup plan and don’t really care if you fail out — there’s nothing to really scare you in the first year. And, at least in my opinion, a lack of fear goes a long way to maintaining your composure under pressure and mastering the 1L crucible. Some time around the 10th grade I really got hooked on civics, public service, and related stuff — read Supreme Court decisions for fun and so on.4 I decided I wanted to be a constitutional law professor at some point, and wanted to be Virginia’s Attorney General when I got older (before I moved to North Carolina and fell in love with this state ). But I also grew up in a family that most folks would consider “poor” financially, so my college focus was on what was going to make me the most $$$ when I graduated. I had a talent for computers and I started at N.C. State right as the dot-com boom was hitting its stride. I was going to become a computer engineer and make six figures starting after graduation. During the five years I was a dropout, I worked in the legal arena the whole time since I could make a decent wage without a college degree. Getting hired for computing-related jobs, by contrast, typically required various certifications that I couldn’t afford to get. So when I finally came back to N.C. State in August 2005, I knew law school was definitively where I was going once undergrad was done. That’s it from me for the night folks! I hope all of you have an amazing week!! This was originally a TDot’s Tips entry titled “Tips for the Pre-L’s” — until I started writing it Monday afternoon, when Delta the 2L sat down next to me in the Fishbowl and wanted to know what I would be doing at 7:00pm that night. Turns out the Pre-Law Students Association at my alma mater was holding a panel discussion titled “What is Law School Really Like?” and she wanted a partner from the N.C. Central University School of Law to help rep for the Legal Eagles. There were about 30 undergrads in the audience, and the panel turned out to be a solid mix of folks with 3 students from Campbell Law, 3 from UNCCH Law, 2 from Duke Law, an alum from Wake Forest Law, and of course Delta and I from NCCU Law.1 I think 6-7 of us were 1Ls, but the 2Ls/3Ls/post-Ls were represented by at least 1 person apiece. The questions covered a wide range of topics that you’d expect from aspiring law students: workload, types of classes, “gunners” and competition, and so on. But some panel members did tend to commandeer the discussion and recognize new questioners before folks had a chance to answer the previous question, and yesterday one of the sophomores in attendance shot me a message. Overall, I enjoyed listening to the panel and attending the event. I do wish the the questions/answers had been more organized so that each student from each law school could have given a more direct answer and that every student could have been given the chance to answer each question. I would have liked to have learned more about the admissions process from the students also. I believe the bar exam was only mentioned once or twice in the whole forum; from what I have heard the bar exam is one of the top things that law students are trying to make sure they pass, that was one dimension that was almost forgotten about….and I’m not quite sure why? It seemed like the whole time all of the students were all up tight and bashing the amount of work load and la la la the whole time. I was like okay I get the point that law school is a lot of work, I’m aware of that now, I am more than willing to put in the time and effort, enough with the talks about how much work it is, tell me more about WHAT LAW SCHOOL IS REALLY LIKE – tell me about the professors, tell me about the elective courses you can take, tell me about the mock trials you can participate in, etc etc. I fully understand, and *commend* every single law student out there for the amount of work they have to put into law school; but this forum was not meant to whine about the work load if you get my gist. Let me preface my thoughts by pointing out I’M NOT NORMAL. You hopefully figured this out at some point amid (i) Student Government being my preferred hobby, (ii) picking a T4 as my first-choice law school despite higher-ranked options, or (iii) deciding to go the law route at all after getting a Bachelor’s degree in Computer Science. I’m strange, I’m upbeat about my own law school experience, and I’m even optimistic about the future prospects for the legal industry. So before reading on, I’d encourage you to check the other bloggers in the list at the right of this page. Dennis Jansen in particular has a ton of advice well worth reading — I read it myself before starting law:/dev/null, that’s how legit it is. The admissions process is going to vary by school of course, but pretty much everyone uses some form of indexing in their decisions. Essentially take your undergraduate GPA and multiply it by a given fraction, take your LSAT score and multiply it by a different fraction, take whatever “special” factors your chosen school considers (e.g. legacy status, socioeconomic status, etc), add all those numbers up and you get your Academic Index score. Students above a certain number get in automatically, below a certain number get rejected automatically, and the folks in the middle get a closer look at your actual application to decide if you should be accepted, rejected, or waitlisted. Any school that tells you they read all the applications is lying to you. There are simply too many applications for every school, and your typical admissions committee is roughly 3-5 people — usually 1 or 2 administrators, and the rest senior faculty. In other words they’re all busy people, and are simply not going to read 1,000+ essays or more per person. Period. Apply early! Most schools also use “rolling admission,” which means they start accepting students throughout the application cycle — including those folks with the high Academic Index scores. Typically that means by the time the advertised “deadline” approaches for a given school, all of the seats have admitted students filling them and you’re competing for spots that only open up when the accepted folks go somewhere else. The odds already are not in your favor; they get precipitously worse by the deadline. Consider applying at public law schools in your state (if they’d be a good fit for you of course). Most state-supported institutions have caps on out-of-state students, making it comparably easier to get in if you’re in-state. For example, UNCCH Law limits out-of-state students to 25-30% of the student body even though out-of-staters typically make up 75%ish of the applications received. Private Duke Law, by contrast, had over 80%+ of its Class of 2012 coming from outside North Carolina. Don’t be afraid to ask for help. I call this the “nontraditional” approach to admissions: if you know someone who’s an alum from your school, or back when you were a kid you used to mow the lawn for one of the professors, or one of your parent’s coworkers knows a friend of a friend who plays golf with the Dean, see if they have any advice they can offer to help you be as competitive as possible. The era of a well-placed phone call to the right person securing your acceptance has largely died off, but there are always “intangibles” in every process and there’s no harm in trying to line up as many as you can in your favor. At most undergraduate universities, when you finish all your required courses you’re usually entitled to graduate, get your degree, and start working in whatever field you studied. After you graduate, you’ll sit and take a bar exam for the jurisdiction where you want to practice. This is essentially a 2-3 day affair featuring multiple choice questions, essays, and similar tests on a variety of subjects to verify your competence to become a lawyer. Pass the bar, and you get to jump through the next set of assorted hoops to get your law license (“character and fitness” reviews, etc). Fail, and you get to wait 3-4 months to try again while desperately trying in the interim to find some way to pay your bills. Training you to pass the bar, enabling you to become a competent attorney, is the #1 job of a law school. It’s also not easy — so make sure you pay attention in your law classes, because that info will be coming back in a few years. There’s not much I can say here that will be useful to any of you, since I honestly don’t think the work in law school is that hard. As a result I was/am already accustomed to sitting in one place in perpetuity (e.g. at a desk) doing the same thing for hours non-stop (e.g. debugging code) and giving up certain necessities of life (e.g. sleep and a social life) to get projects done on time. Law school has been a cakewalk by comparison, since the only “project” is generally a midterm and final exam — and reading case law for a few hours is infinitely easier than tracing Java code looking for an elusive bug. Law school is a sizable volume of work, for certain. You’ll want to read all the cases you’re assigned so you’re able to understand the discussion taking place in class, which in turn will make it easier to digest the material and study for finals. They’re all different, and it shows. MDG and Professor CrimLaw both have witty and disarming personalities — and are merciless graders who force you to know your material. Professor Torts takes a more disciplinarian approach. Professor Ks represents the “new school” and is more laid back than the others, while The Traveling Professor holds it down for the “old school” with her regal demeanor. One unifying characteristic of the professors is that they’re all smart people. And the vast majority are friendly, approachable, and go out of their way to help students succeed at learning the law. After all, even these folks were 1Ls once upon a time. The key is to not let yourself get intimidated — as your legal elders they’re entitled to a certain level of deference, but not to the point where you’re afraid to talk to them. I’m not really qualified to say much here, simply because for almost all law schools your 1L year will be set in stone for you and cover “core” classes like Property, Contracts, Torts, Civil Procedure, Criminal Law and Constitutional Law. 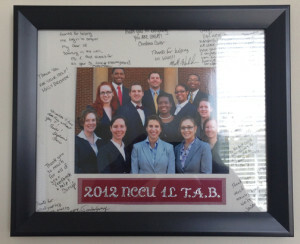 If you want to browse around, NCCU Law has most of its electives posted online. Typically law schools will have electives on a huge range of topics (intellectual property, bioethics, veterans law, etc) and offer law clinics for students to experience first-hand different areas of the law where they might be interested in practicing. But given the breadth of offerings and the differences between each law school, the best I can recommend here is to check out the individual offerings for every school you’re interested in. This is another area where the philosophies of law schools tend to differ,3 but at many schools 1Ls get to participate in most of the exact same stuff as their upper-level colleagues. Speaking for myself here at NCCU Law, I took part in 3 different mock trial competitions just for 1Ls, signed up for the 1L Moot Court competition (before realizing it conflicted with a UNCASG meeting), participated in an ABA-sponsored client counseling competition, played on the 1L basketball team in the annual Law Week tournament, attended several events for the Black Law Students Association, and got elected Treasurer of the Student Bar Association. And there are literally dozens of other groups and activities that I could have done if I had other interests (or more time). Most law schools will have class councils that throw parties, hold forums, host speakers, and so on. You’ve got legal fraternities like Phi Alpha Delta and Phi Delta Phi. You’ve got BLSA and HLSA and undoubtedly other LSAs I don’t know about. You’ve got liberal orgs promoting things like workers’ rights, conservative ones promoting things like constitutional originalism, and everything in between. So as far as extracurriculars go — at least in my admittedly limited experience — law school is as much a full-spectrum experience as college. If I could change one single thing about my experience here at NCCU Law, I wouldn’t be as nervous. Those of you who are long-time readers at law:/dev/null might recall the comedy of unforced errors that was my orientation experience. I’ve taken my Socratic beatings too. But you know what I found out over the course of the semester? Everybody experiences the same thing at some point. All the 1Ls are going through the same trials and tribulations. Some folks are more adept at it than others, but there isn’t a single person out of the 50ish in my section who haven’t been flummoxed by a professor. Rather than the “gunner”-filled atmosphere you read about, most of your classmates will be on Facebook or Gchat or “whispering” hints at a slightly-above-whisper level,4 all trying to help you succeed — because they’ve either (i) been there too or (ii) will be soon. That’s my $.02 on what law school is really like, at least on those few topics Feel free to hit me up if you have any other questions! Until then, have a great night everybody! I check the server logs here at law:/dev/null at least twice a day, primarily to keep a check on the source IPs and the search queries that lead folks here — most of them are innocuous enough,1) but if I notice an otherwise-arbitrary uptick in visits from the law school’s network I try to preemptively think of responses to anything a professor or classmate might inquire about. Do you really send/receive thousands of text messages in a month?? A: Yep. It all started when I got elected Student Senate President at N.C. State back in April 2007. I used to have a 12-button Motorola E815 — which had an über-hackable OS that I didn’t want to give up — and a “500 messages per month” data plan. By the time school started in August, I had sent/received 854 messages… which led to a $35 overage charge on my phone bill. Somehow the next month that had climbed to 1,959 messages, which prompted a visit to my local Verizon Wireless store and an almost-free upgrade to a BlackBerry 8830 with unlimited text messaging — a much better deal than the ~$150 overage I would have had to pay otherwise. Then things just went crazy from there. 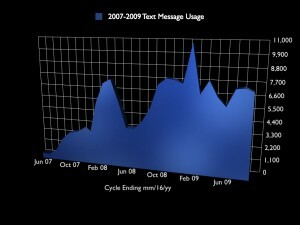 TDot's text messages over time. Each vertical hash is 1100 texts. The following March I was reelected to a 2nd term as Student Senate President and a few weeks after that elected President of the statewide UNC Association of Student Governments, becoming the 1st person (so far as we know) to hold both the ASG Presidency and a major institutional office at the same time — and bringing a corresponding text message frequency with it. I peaked at 10,821 messages in January, and have settled around the 7K mark for the past few months. How are you adjusting to a historically black university like N.C. Central coming from a predominantly white school like N.C. State? Has it been difficult? A: It hasn’t taken much adjustment at all, at least for me. The black community at N.C. State was one of the three core groups who put me into office along with CALS students and teh Netr00tz, if that offers any insight to my background. The only significant change between N.C. State University and the N.C. Central University School of Law has been the technology. The Computer Science Department at NC State is very *nix-heavy, so technology is platform-neutral and Linux + Mac users fit right in. By contrast NCCU Law, like most law schools, is a mostly-Microsoft shop. The tech support folks aren’t well-versed at all in anything beyond Windows, so I’ve played the role of “hey you, computer guy” on more than a few occasions. A: Seriously I’ve been a conservative since high school and a registered Republican since I was eligible to vote. My political views aren’t exactly orthodox though. As an example, I believe in limited government, supply-side economics, firearms, a strong military and an interventionist foreign policy; my time being homeless left me with little sympathy for the poor; and I think most strident liberals are ideologically incoherent and hate America. The net result is a guy who got himself elected as the youngest Vice Chairman in Wake County GOP history some years ago, got thrown out of the party entirely just 2 years later for being “too liberal”, then spent most of the years since working with politicians from both parties. That’s all I’ve got for this entry folks — have a great night! Before diving in, I just want to note I ran out of nails while finally building those bookshelves today. Nails. Shiny 7/8″ nails. I didn’t even know that was possible. Nails are like the pennies of the carpentry business: they’re generally worthless individually, you inadvertently amass hundreds of them in a fairly short amount of time from totally different projects, and if you ever need one but can’t find any in the usual locations all you typically have to do is go poking around the house. But there I was in the middle of shelf building, about to nail in a base board to a drawer, I reach for another nail, and… nothing. I go to the toolbox, and… nothing. I look around the apartment, in the kitchen, in the closet, in the storage unit, and… nothing. So did you, like, you know, have a bunch of study materials and stuff for the LSAT? When did you start studying before taking it? A: The only thing I had for preparation was the TestPrep book or whatever it’s called that you can get from LSAC. I ordered it when I ordered my LSAT admission ticket. The book still sits unopened on my bookshelf though because I never actually studied for the LSAT. The lack of studying wasn’t intentional, and I don’t recommend it — at all. But in my case I had an academic backup plan in place (if I didn’t make it into any law schools I’d stay at N.C. State and start a Ph.D. in Economics), so the urge to prepare tended to evaporate if I was stressed about other stuff. My plan was to take the test just to experience it, then re-take it this past June and start law school in Fall 2010. How did you do on your election for 1L SBA representative? A: I’m 99.9% sure I lost. None of the classmates I’ve asked have been able to find a listing of all the results, but at least one candidate wrote on her Facebook that she got elected so I’m assuming the SBA folks just emailed the winners. You keep mentioning this Gang of Eight. How’d you come up with this group? And who’s in it? That’s everything I’ve got for tonight. Have a great evening folks!